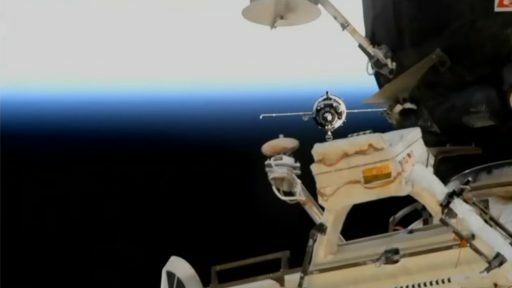 Russia’s Soyuz MS-08 spacecraft pulled into a docking port on the International Space Station on Friday after two-day journey from a remote launch pad in Kazakhstan to the orbital home and workplace for three experienced space fliers spending the spring and summer months off the planet. 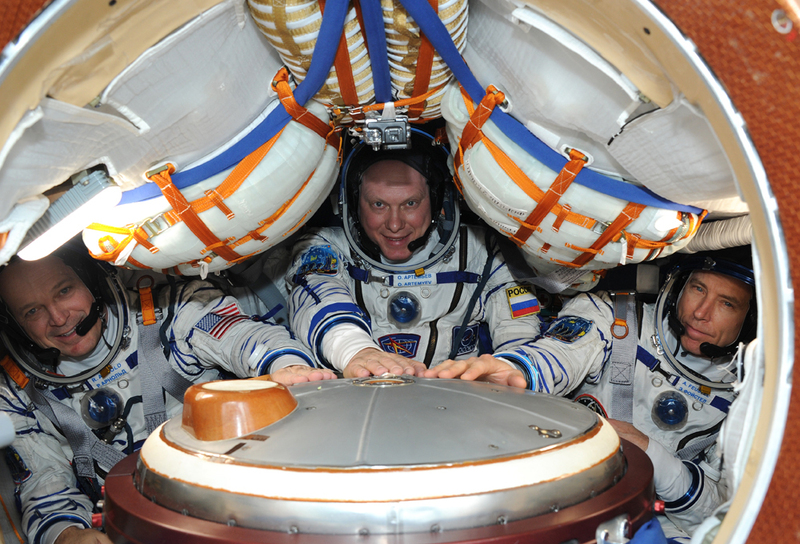 Soyuz veteran Oleg Artemyev, Hubble handyman Drew Feustel and educator-astronaut Ricky Arnold are kicking off a 158-day stay on board the orbiting laboratory as part of Expedition 55 and 56 through late August 2018, set to tackle a busy schedule of world-class science, a series of visiting vehicle moves and a number of outfitting spacewalks coming up over the next five months. 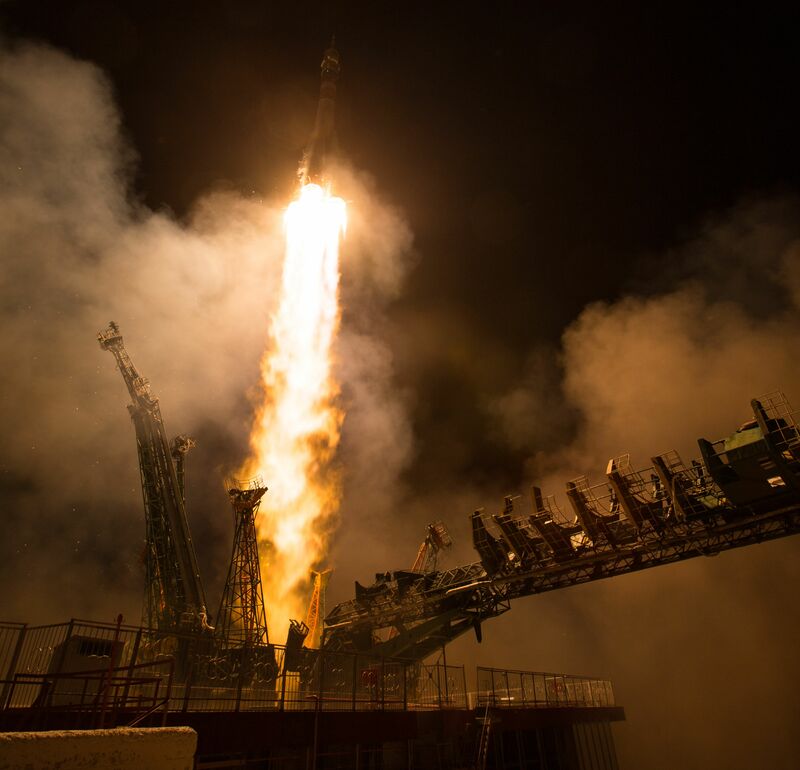 The crew’s voyage began Wednesday night with a picture-perfect launch atop Russia’s trusted Soyuz FG rocket, thundering off from Site 1/5 at the Baikonur Cosmodrome at 17:44 UTC to begin a chase of the International Space Station. Rising with a thrust in excess of 420 metric-ton-force, the 49.5-meter tall rocket arced into clear skies over the remote launch site – dropping its four boosters two minutes into the flight and handing over to the rocket’s third stage just shy of the T+5-minute mark for the final push to orbital velocity. Eight minutes and 45 seconds after launch, the raw power of rocketry transitioned to the familiar sensation of microgravity for the three experienced crew members aboard the tight quarters of the Soyuz Entry Module. Soyuz FG successfully lifted the 7,220-Kilogram Soyuz MS-08 spacecraft into a Low Earth Orbit, checking off the 63rd mission of this particular variant of the seasoned launch vehicle family. Soyuz, flying under the call sign ‘Hawaii,’ achieved an initial orbit of 196 by 232 Kilometers from where it was set for a methodical climb up into the Space Station’s 403 by 406-Kilometer orbit – sticking to the scenic route of the longer, two-day rendezvous as several launch date moves precluded the months-long orbital setup needed for a rendezvous on the express lane. 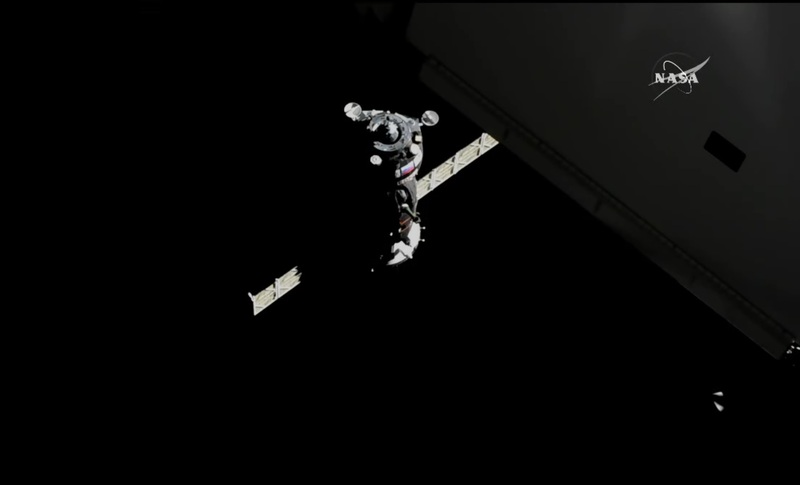 Confined to the cramped quarters of the Soyuz for a two-night stay, the trio spent the first orbit of their mission checking the craft’s systems before entering the Orbital Module. Setting up for its link-up with the International Space Station, Soyuz MS-08 conducted its first two-orbit raising burns on the mission’s third and fourth laps around the globe, speeding up by 34 and 27 meters per second, respectively, to ascend into a 310 by 320-Kilometer orbit. The three crew members entered their first sleep period on Orbit #6 and Thursday had a fairly light schedule: Oleg Artemyev conducted a manual control test to ensure he could bring the craft in for a manual docking if needed, the crew went through some routine checks to ensure Soyuz was in ship shape and a small orbit tweak on the 17th revolution lifted Soyuz into a 315 by 321-Kilometer orbit to reach the correct position for the initiation of the automated rendezvous. 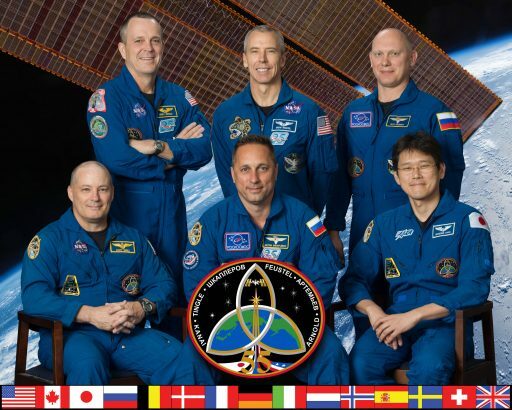 The crew awoke from their second sleep period on Orbit #27 and went into final preparations for their link-up with the International Space Station, receiving an updated rendezvous profile based on the latest tracking data before moving into suit-up and vacating the Orbital Module to oversee the maneuver from their seats. “Hawaii” initiated the fully Automated Rendezvous Sequence at 17:18 UTC and executed a final ground-targeted orbit-raising burn at 17:42 to maneuver into the 200-Kilometer communications zone around ISS for the acquisition of a KURS navigation link and a space-to-space VHF connection to allow ISS to serve as a relay point between the approaching Soyuz and Mission Control in Moscow. 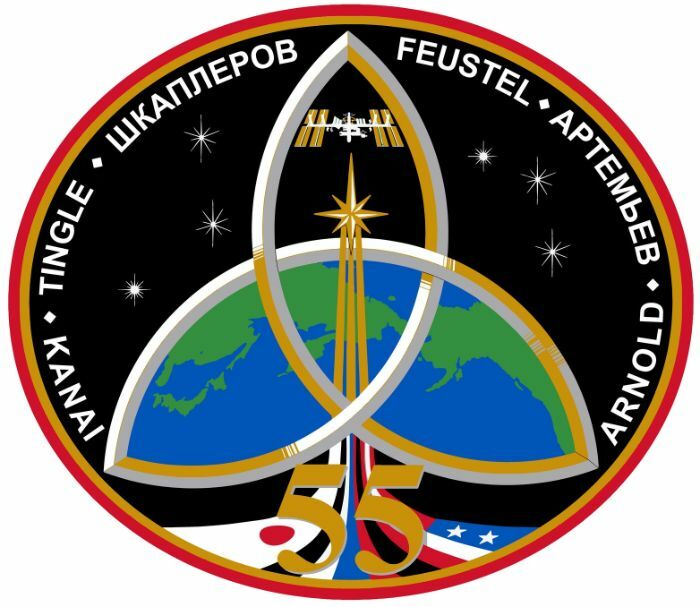 Kicking off the relative navigation phase at 18:08 UTC, Soyuz powered up its upgraded KURS-NA navigation system – first locking onto the KURS beacon of ISS through the AO-753A phased array antenna for initial line-of-sight and pitch angle measurements during the long-range rendezvous. Two ASF-1 antennas came into play at closer distance to deliver range, range rate and angular information to the Soyuz’s Digital Autopilot in control of targeting rendezvous maneuvers. A large impulse burn of the 300-Kilogram-force SKD main engine sped Soyuz up by 27 m/s and set it on a course toward its Ballistic Targeting Point – an imaginary target position around one Kilometer from the Space Station to allow Soyuz to safely fly past the Station in case of any issues cropping up during the far-field rendezvous phase. A pair of checkouts of KURS at a distance of 45 and 15 Kilometers provided good results, allowing the rendezvous to proceed on auto pilot – under close watch by Commander Artemyev and his Flight Engineers. ISS handed off attitude control to the Russian Segment and a small attitude adjustment was performed in the form of a 12-degree yaw and a slight pitch-up to properly position the Poisk module for the arrival of the Soyuz. As the spacecraft passed the ballistic target, it conducted two SKD impulse maneuvers and a braking burn using its DPO attitude control thrusters to proceed into the ISS Approach Ellipsoid, en-route to its flyaround. Reaching a range of 400 meters, Soyuz switched into Flyaround Mode to make a slow lap around the complex, designed to take the spacecraft from its approach path from behind and below to a position aligned with the zenith-facing Poisk module. 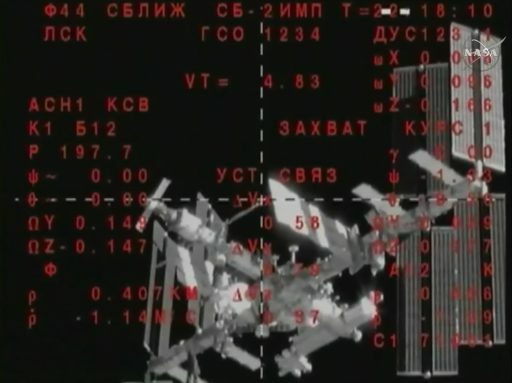 While maneuvering around ISS, Soyuz remained on KURS lock and closed in to a distance of 200 meters. Once aligned with Poisk, Soyuz stopped its approach and performed a roll maneuver to position its solar arrays for docking before nulling any residual body rates and entering a period of Stationkeeping. Receiving a GO from the ground, Oleg Artemyev commanded the Soyuz into final approach mode at 19:30 UTC and the spacecraft gently fired its DPO thrusters to initiate a relative closing rate of 0.8 meters per second for its straight-down approach toward Poisk. 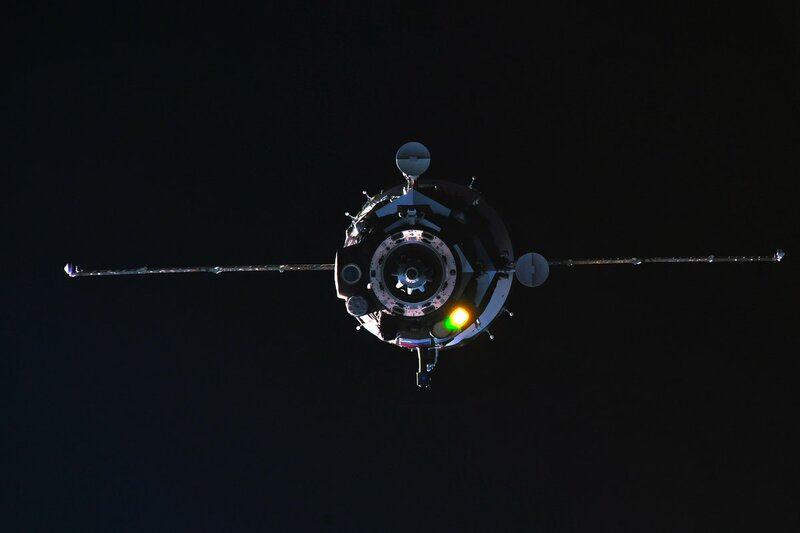 Under control of its automated systems, Soyuz kept its crosshairs aligned with its docking target, powered up the SSVP docking mechanism at a range of 47 meters and retracted its KURS antennas to avoid interference with the docking interface. Upon sensing that its docking probe had made contact with Poisk, Soyuz fired its translational thrusters to push in and so ensure that capture latches would engage and secure the coupling between the two orbiting spacecraft. 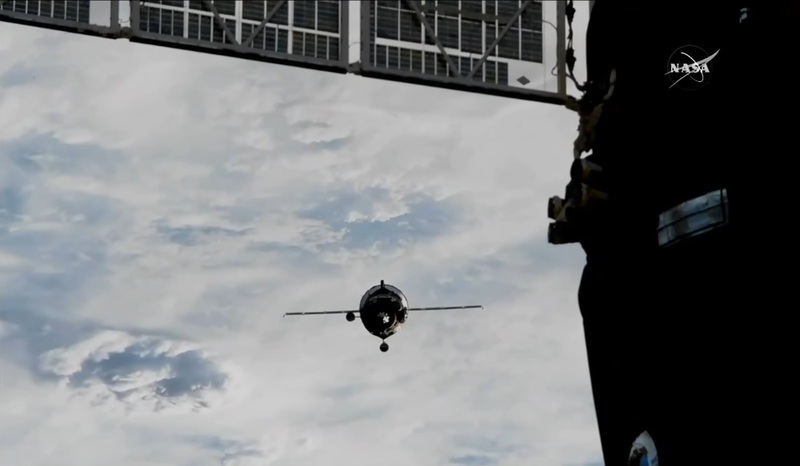 Contact and capture was confirmed at 19:40:21 UTC while the complex was flying over Eastern Europe with docking coming two days, one hour and 56 minutes after the launch of Soyuz MS-08. After some oscillation induced by docking had dampened out, Soyuz retracted its docking probe and latches on both sides of the interface closed to form a rigid structural connection between Poisk and the Soyuz. While keeping an eye on their leak check procedure, the crew was able to change into more comfortable flight suits and begin powering down systems aboard their Soyuz. 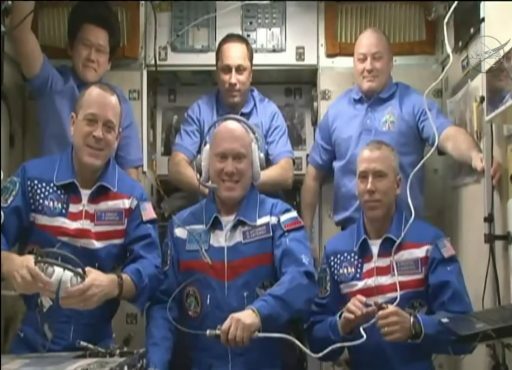 Hatches swung open at 21:48 UTC and the incumbent ISS crew of Expedition 55 Commander Anton Shkaplerov and Flight Engineers Scott Tingle and Norishige Kanai welcomed the new arrivals aboard their home in space for the next 22 and a half weeks. The first order of business for the combined crew was the traditional family conference from the Zvezda module before they headed into mandatory safety briefings and deactivation of their Soyuz spacecraft, looking forward to a full off-duty day on Saturday. Facing a flurry of operations coming up over the next few weeks, the six Expedition 55 crew members will hit the ground running heading into next week with the departure of the Progress MS-07 spacecraft expected on Wednesday while spacewalk preparations will dominate the U.S. crew’s schedule to gear up for a March 29th excursion by Drew Feustel and Ricky Arnold. This marks one of the shortest intervals between an Expedition crew’s arrival and a spacewalk, taking advantage of a break in the Station’s visiting vehicle schedule plus a period of light activity from a science standpoint as new science will only head to ISS in early April on the upcoming SpaceX Dragon mission. Both Feustel and Arnold have previous spacewalk experience, in fact, Feustel ranks in the Top 20 on the all-time list with over 42 hours of career EVA time collected during six EVAs servicing the Hubble Space Telescope and the International Space Station. Thursday’s EVA has the primary objectives of installing wireless communications gear for the ECOSTRESS ecosystem monitoring instrument launching to ISS on SpX-15 and adding equipment for the C2V2 visiting vehicle communications system coming into operation later this year for the first test flights of the Boeing Starliner and SpaceX Crew Dragon vehicles. Additional work lined up for EVA-49 is the reconfiguration of a radiator beam valve and the replacement of an external camera group plus several potential get-ahead tasks if time permits. After the planned spacewalk, focus will shift back to science as the Dragon SpX-14 spacecraft continues tracking launch on April 2nd and arrival at ISS on the 4th – delivering 2,647 Kilograms of cargo including three external payloads comprising two science facilities & a spare part, and 1,721kg of pressurized cargo consisting of dozens of investigations in materials, physiological and plant science. The crew will have their hands full throughout April as a number of experiments riding up on Dragon are to be performed in time to return to Earth on the same spacecraft. Over the course of their stay, the Expedition 55/56 crew will support over 300 experiments, oversee up to six visiting vehicle arrivals and support additional spacewalks heading into the summer. The majority of the crew’s time in orbit will be focused on scientific experiments after ISS was able to step up to regularly completing 80 to 100 crew hours of science per week on the U.S. Segment, enabled by the increase to four crew members after Russia decided to reduce its crew while waiting for the launch of the Nauka laboratory module. Science ongoing aboard ISS covers virtually all branches with particular emphasis on human research to study the effects of prolonged space flights on bodily systems – knowledge deemed necessary before sending crews on extended journey to distant targets.